The importance placed on high-quality organization, staff, equipment and services to a small team of 4 to 6 trekkers-climbers only. 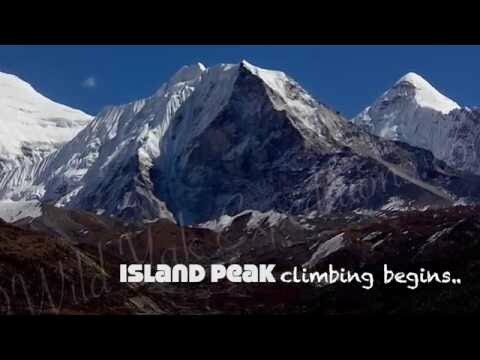 Island Peak is one of the most famous 6000-meter peak in the Himalaya. A Swiss expedition team first climbed the peak in 1956 as a training exercise. The expedition was considered as a preparation for the ascent of Mount Everest and Lhotse. Many mountaineers still focus on Island Peak as an acclimatization climbing peak. Imja Tse is another name for Island Peak. It is because of the Imja Lake below of the mountain. Island Peak is located in the Everest Region (Sagarmatha National Park). The region is famous for its glaciers, deep valleys, stunning mountains and some of the high Himalayan rare animals. Beside the spectacular mountain scenery the friendliness and hospitality of the Sherpa people is fabulous. The trekking trails are well maintained and properly rubbish managed. The lodges are clean, comfortable and serve delicious fresh food. For these reasons, it fascinates the trekkers from all around the world. The flight to Lukla offers a stunning view of the Himalayan mountain range and below the plane on the vast agricultural terrace of the hilly region. The beginning of the trekking till Namche consists of green vegetation, lush forest, colourful monasteries and stone craft walls. After Namche, the landscape dramatically change to a treeless territory with an outstanding views of 8000-meter giants like Mount Everest, Cho Oyu, Lhotse, Makalu. As well as of numerous 7000-meter peaks including the beautiful Ama Dablam, the “Matterhorn of Nepal”. An acclimatization rest day at Gokyo in the magical surroundings of the turquoise blue lakes encicrled with mountains enchants the minds. But provides us also enough energy to prepare for our Cho-la pass and Island Peak climbing. WILD YAK EXPEDITIONS proposes the climbing of Island Peak via its southwest ridge. A spectacular climbing view to discover from the summit. WILD YAK EXPEDITIONS competent and experienced Sherpa Guides accompagny the Group till the summit, and back to Base Camp. On our way back to Lukla, we reach the World Heritage site Tengboche Monastery through a forest of Juniper, Fir, and Rhododendron. Wild Yak Expeditions believes an Adventure in the outdoors provide various health benefits, ranging from physical to mental to spiritual. Himalaya is the best place where we have enough time to discover oneself and rejuvenate our life by positive wellbeing. In order to be productive and happy, it is scientifically proven to create some gap particularly from the worldly negative news, social media and our daily hectic life. Beside personal benefits, it also contributes to help the local economy by visiting remote areas. WILD YAK EXPEDITIONS Team welcomes you in the Himalaya. We commit to organize small groups of maximum 6 participants with high-quality services and safety. These are essential for flexibility, contentment, and good ambience within the Group. Furthermore, it generates sufficient time to exchange our culture and tradition with our local Team. Finally, hospitality to our Guests and economy to the locals are a great part of our aspirations. Ich möchte mich noch ganz ganz ganz herzlich für die tolle Organisation von Wild Yak bedanken. Wir haben eindrückliche, spannende, interessante Ferien erlebt und uns dabei rundum wohl gefühlt. Do not hesitate to contact us for a customized Island Peak Trip. WILD YAK EXPEDITIONS’ philosophy is: as much as possible is included in the quoted price so that so that each participant knows the total costs of his/her Adventure Trip in advance! The success of this Journey depends on both the personal status of each participant and the experience of our Team. WILD YAK EXPEDITIONS' Team carefully selected according to their expertise in the particular environment and individual aptitudes. Our Team is thus highly experienced, skilled, trained, courteous and helpful. He further provides you with interesting information about the mountains, the culture, and traditions of this part of Nepal. He also makes sure that the rubbish properly managed, and the route is kept clean throughout the whole Trip. He will further help as the interpreter with the local population. Though WILD YAK EXPEDITIONS is in charge of the booking of the majority of the lodges, it is the Guide responsibility to ensure that the lodges are convenient and the food of good quality. WILD YAK EXPEDITIONS will frequently be informed about the progression of the Group during the trekking/climbing experience. Our Climbing Sherpa (assistant guide): has a government license but must work as an assistant guide during some time to become a company approved guide. He assists our Sherpa Guide with all essential duties, ensuring the safety and checking that the performance of the group runs smoothly. He accompanies and supports our Sherpa Guide during the climbing period of the peak. Note: In some places where the porters usually replaced by yaks, it is the responsibility of the yak driver ("yak man") to ensure that the transportation of material carried in an appropriate manner. In Kathmandu: we stay at Tibet International and Yak & Yeti hotels on a sharing basis, including breakfasts. Depending on availability, single rooms can be booked upon request at an additional cost. All dinners are served in excellent restaurants in town where you can enjoy various types of cuisine, from the typical Nepali, Thai, and even steaks and Italian meals. Each restaurant has been screen by WILD YAK EXPEDITIONS representatives to ensure that it is of suitable quality for our guests. Transportation: all transportations in Kathmandu are by private vehicles. Flight to Lukla and back, are by two engines planes, Otter Aeroplane. During Trekking: we stay in the lodges (small traditional mountain guesthouse) that are recommended by WILD YAK EXPEDITIONS as per defined itinerary destination and program. Please be aware that single rooms are not available. Though there are blankets available at the lodges, we recommend bringing your sleeping bag. Showers are available at the majority of the lodges. Please note that majority of the toilets are common in the lodges, except in few of them where we provide you with attached rooms (if available), in particular at Namche and Gokyo in order to fully enjoy your rest day with a shower. Base Camp: According to the present program, we settle a campsite for the Island Peak climbing, installing dining and kitchen tent and enjoy the meals prepared by our Kitchen Team. Sleeping tents are provided on a sharing basis with a mattress individually. To make your stay comfortable in the campsite, WILD YAK EXPEDITIONS offers the lightening for the dining tent and solar batteries charging facilities. A team of 2-3 qualified and experienced Sherpa Guide secures the ascent route by fixing ropes in the technical parts of the mountain, where necessary. A basic mountaineering exercise is usually conducted at the Base Camp before climbing. Our Sherpa Team is then guided you to the summit, and way back. Weather reports regularly forwarded during the climbing period and as well while crossing the pass, in the event of the unstable weather situation. Our Sherpa Guide is also outfitted with communication means, only to be used in emergencies. WILD YAK EXPEDITIONS also works with the national helicopter rescue airlines. To minimize risks, in particular during the crossing of the higher passes and the climbing period of the Peak, weather forecasts are provided to our Sherpa Guide on a regular basis and the route will be secured by our Sherpa Team by using the necessary technical gear for fixing the rope and assisting the Group of participants all the way to the summit and back. Please note that the above-mentioned itinerary information is purely indicative and can likely to modified during the trekking by our Sherpa Guide, who has the authority to make such changes if it is deemed necessary (due to safety concerns, etc.). Every effort will be done to keep to the scheduled itinerary. However, as this is an adventure travel in remote mountain regions and at high altitude, we are not able to fully guarantee it as it is necessary to take into consideration each situation as it occurs and consequently to adapt the program in its best way. Elements such as weather conditions, health conditions of a group member, unexpected natural disasters, among others, can all contribute to changes in the scheduled itinerary. Our Sherpa Guide will try to ensure that the Journey runs according to the foreseen plan to the benefit of all the participants, but we thank you for being prepared to some flexibility and comprehension if so required. Please check the degrees of difficulty while choosing a Trip with WILD YAK EXPEDITIONS. The majority of the itineraries proposed in our Programs are in remote areas of the Himalaya and at high altitude, mostly higher than the Alps. A good physical condition is necessary to appreciate the whole richness of this adventure. Note: Please be aware that for this Journey, the participants must have experience with the handling of crampons and glacier walk. Before you embark for your Island Peak trekking and climbing Journey, WILD YAK EXPEDITIONS recommends a regular physical exercise including some stretching exercises for a couple of hours per week. Ideally, you should concentrate on cardiovascular fitness, building an excellent stamina and undertake a bit of strength training to be more efficient in the mountains. It is worth to go for at least once a week for a 3 to 4-hour hike, which familiarizes already your body to sustain the long-time effort in the Himalaya. The fitter you are, the faster and more easily you will get the trail, acclimatize and enjoy the trekking days. WILD YAK EXPEDITIONS proposes a simple grading system that gives you a first idea of the difficulties of the Trip for which you might apply and enables you to determine which is the best for you.